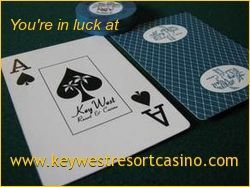 (April 6, 2013) The Key West is proud to welcome vegas-aces.com, a great website that provides free videos on how to play and deal casino games. Their blackjack videos are posted on their own page under the "Play" section of our navigation bar. We highly recommend everyone watch these videos, and support vegas-aces.com. The casino's visitor counters showed 137 unique visitors on Saturday, March 23, 2013, visiting 168 pages on the casino's site. That's one new visitor about every 10 minutes, and the casino's best day in March. (March 23, 2013) On Saturday, March 23, 2013, the Key West Resort & Casino received a response from Bob "The Coach" Ciaffone, legendary poker player and author of Robert's Rules of Poker. The Coach approved our use of Robert's Rules on our site. The rules are now posted.